1260XL-B - Water Hammer Arrestor Size "B"
The Zurn Wilkins model 1260XL-B is ideal for use where lead-free fittings are required. It's designed to protect residential, commercial and industrial water lines during pressure surges following quick valve closure. Z1260XL Series may be installed within a stud bay without the need for an access panel. Size B Water Hammer Arrestor protects residential, commercial and industrial water lines against over-pressure during surges following quick valve closure. Designed to fit within 2"x4" construction. 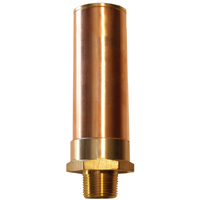 Size C Water Hammer Arrestor protects residential, commercial and industrial water lines against over-pressure during surges following quick valve closure. Designed to fit within 2"x4" construction.